Automation is a sport all by itself. With the introduction to automated units and components inside the home, it didn't take long to utilize them outside the home. However minimizing the process and control of outside automation is important to spouses and guests. There are many advantages to automation when working with pools, hot tubs, outdoor lighting and landscape lighting. I think it all is well and good if it still remains on the simpler scheme of things to operate. The outdoor covered kitchen for instance may have overhead lights, heat, outdoor kitchen lights, music, television, movies and internet. That is a small room in itself. One way in which automation works optimally is to synchronize it with the system in which you already have and are used to indoors. Many times it is easiest to add outlets outdoors that are classified as accessories on the inside command system and plug or wire items outdoors into this system. As far as sound and lights go, transformers can relay the intuitive from indoors to outdoors. For instance wireless rock speakers around the outdoor kitchen and pool can be added more easily to an already house adapted system indoors. The use of multi switch toggle systems help control outdoor lights already earmarked and dimmed to approved illumination. This works well as for many guests they can just hit a switch on a column or pier and the system already engages to the perfect preset light source, water temperature, sound station etc. Preparing a list or getting a handle on some of the items or more important things you would like to automate right from the beginning saves time and head ache. Running everything by iPad, iPhone or android is becoming even more popular. Advanced security systems can be viewed upon from your laptop or phone even when absent from the property. 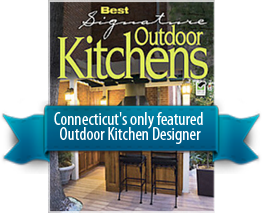 It is a slow curve to learn how to automate your outdoor living space but I think down the road everyone will be doing it soon. Most times it is best for controlled automation from a vantage point inside the outdoor kitchen or anchored to a column or securely mounted to a house facade. Many times programmed remotes can be lost or simply get wet poolside. You also don't want to be glued to your phone all the time.